One of the problems that every tatter must face is the inevitability of running out of thread on the shuttle and having to add new thread. As a beginner this may seem to be a daunting task, but it really isn't that hard. Here are some pictures showing how I do it. 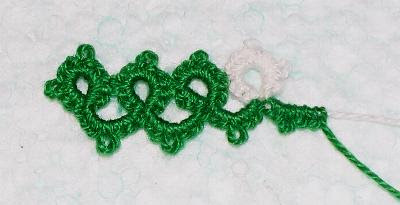 For the purposes of this tutorial I began with size 10 thread in green and at the point where I add in the new thread I switched to white so that you can clearly see the old and new threads. Wherever possible I add in the new thread at a ring where I can easily hide one end in the ring and the other end in the following chain. That may mean that my old thread is quite long and hard to deal with so I cut it to about three inches. Fill your shuttle and begin making a ring with the new thread. 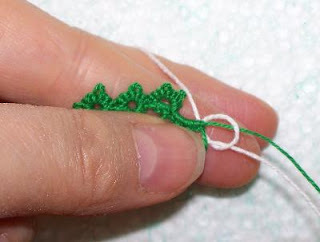 Insert the old end under the first half stitch alongside the core thread like this. 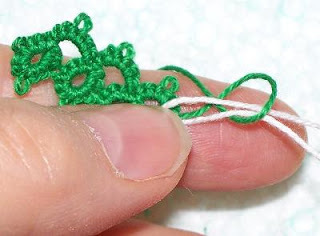 Tighten up the stitch and snug the old tatting up to the ring just started. 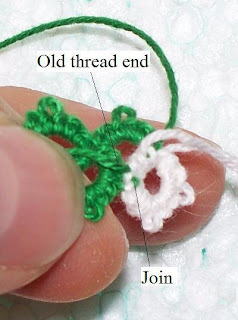 Take the old end of the thread across the core thread away from you. 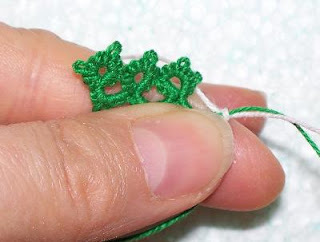 Tat the second half of the stitch and bring the old end across the core thread toward you. Tat the first half of the next stitch. Bring the old thread across the core thread away from you. Tat the second half of the stitch. Bring the old end across the core thread toward you. 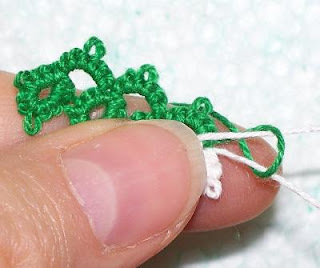 After you have done this with 3 or 4 doublestitches, give the old thread end a hard pull to make sure that there is no slack in the old thread. 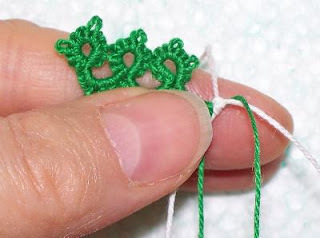 Finish tatting the ring and close it. You can see where the old end comes out between the stitches and you can see the spot of green where the join is, but you don't see any of the green in between where it is zigzagged through the half stitches. 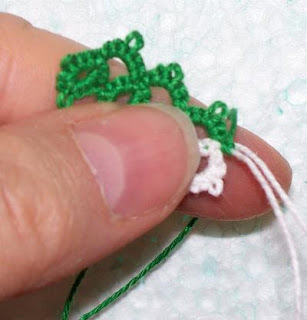 Now reverse work and begin the chain in the same manner, bringing the white end of the new thread under the first half stitch. Tighten up the first half stitch. Take the end of the new thread across the core thread away from you. 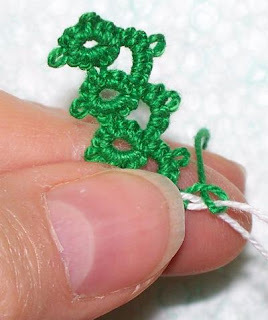 Make the second half of the stitch. Bring the new end across the core thread toward you and tat the first half of the next stitch. 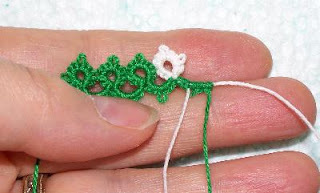 Bring the end across the core thread away from you and tat the second half of the stitch. 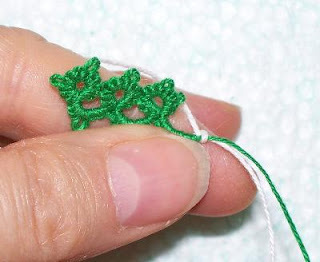 Bring the thread across the core thread toward you and tat the next half stitch. 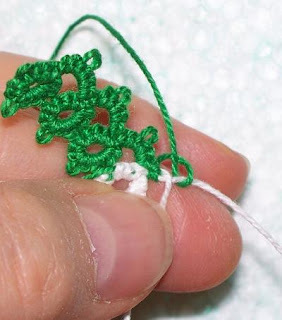 When you have zigzagged the thread end between 3 or 4 stitches, pull on the end to make sure there's no slack in it and finish tatting the chain. 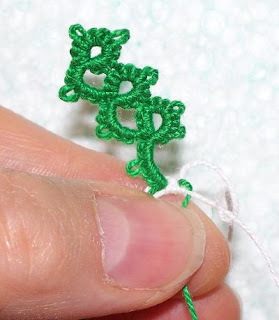 See how you can see the thread between the stitches when they are spread out? Once the stitches are snugged up together you can't even see the thread ends even when you work with 2 different colours. 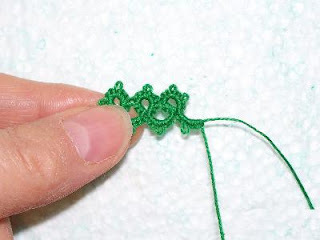 I usually just leave the ends hanging until I have finished tatting the piece, then I pull the ends tight and cut them close to the lace being careful not to cut the stitches. Then wiggle the stitches a bit and the last shred of the end pulls in between, held firmly in place and virtually invisible. 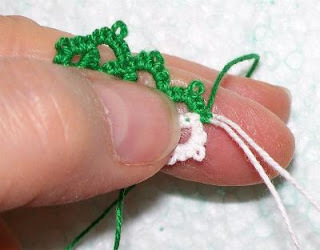 The thread end is shown here coming out between the stitches so that you can see for yourself how hard it is to see any tell tale sign of the hidden ends. This is size 10 thread and if you can't see it here you certainly won't in anything finer. Sometimes, when both shuttles (or shuttle and ball thread) are about to run out at the same place, I cut both ends. Then I wind my shuttles again CTM. I hide the old core "ring" thread in the ring and the old "chain" thread in the chain. Since the thread is wound CTM I'm starting in the middle of the CTM and I only have the 2 old threads to hide rather than 1 old thread and 1 new thread. This is easier than adding in new ring thread and dealing with 2 ends, then a little while later adding in new chain thread and dealing with 2 more ends. As a designer I often work with whatever thread is on my shuttle at the time. Sometimes my shuttle is full when I start and sometimes I've had 2 or 3 tries at something and there isn't a lot on the shuttle to work with. If I stopped to rewind the shuttles every time a project didn't work as planned, I'd end up wasting a lot of thread. 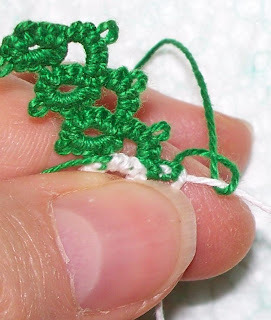 Using this method for adding in new thread, it doesn't take very long to secure the thread ends and get on with my tatting. As you can see, adding in new thread isn't something to be afraid of. You can do it quickly and easily with relatively little difficulty. Just so that you can see the end results, here is the finished piece. Thanks for the tutorial, Sharon! 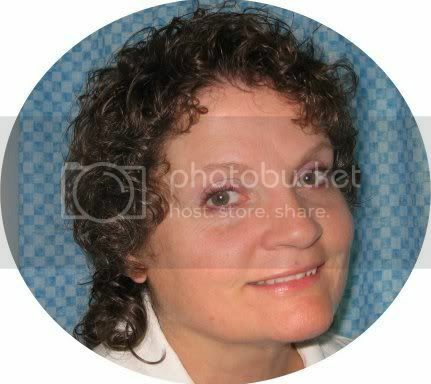 Your photos make the process very easy to understand. Thanks for posting this! The nice clear photos make it easy to follow. I'm not afraid of adding thread any more. Thanks for posting this tutorial! 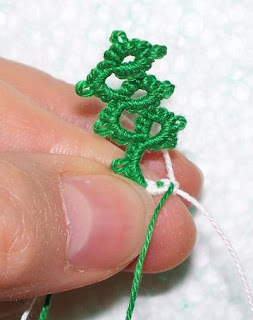 I've always hidden both threads in the ring and that can make it bulky sometimes so I'll have to give this a try next time!!! Can't wait to try this. I suppose it ends up being like sewing in ends when you've finished!! Brilliant idea. Thanks for showing it so clearly. I'm glad to see someone else who doesn't tie a knot to add a new thread. 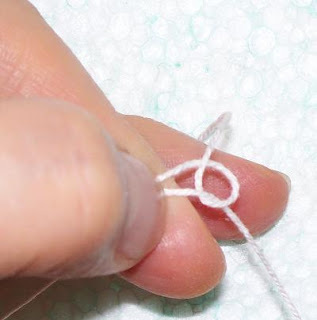 I can't seem to make the weaver's knot so I've always just skipped the knot part. I weave the ends in very like you do, and have never had anything come undone. I am going to try that zig-zag thing you do though -- I've just been wrapping the old thread around the new and the zig-zag looks easier. Thanks for the tutorial! Thank you for the perfect tutorial. 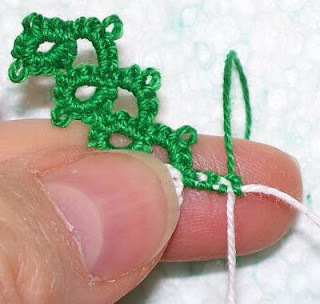 You do such a great job of explaining and showing with pictures that your technique is very easy to follow and helps improve the quality tatting for all levels of tatters. I tried this last night. It works much better than what I have been doing because the work doesn't get a thick spot and even the shortest threads don't pull free. I even tried tugging on it. Wow. Thanks so much, Sharon! I thought that's how everyone did it, until I saw some pictures. That's why I thought I'd show my version. Glad it helps. I hate the lumpy look of just laying the thread alongside the core. Besides, if it's just laying there there's nothing to make it stay in place and I HATE loose ends coming out. I printed it out and within a day I had a perfect chance to try it out. I had both shuttles getting ready to empty at the same time and this worked like a charm. Thank you, Sharon. Tried your way of hiding ends on the weekend. Its FAR easier than any other way I've tried. You rock! this is wonderful way to add threads. I think the would be very secure this way. Am going to try this method. Thanks for the tutorial. May I save it and maybe print it so I can read from the paper and follow instructions that way? What a fabulous "trick"! I just did it my time and I LOVE it! A must have tutorial! Thank you so much!!! Next time, when I give a tug, the old thread won't pop out! What a wonderful way to add a new thread. I will certainly give it a try. Thanks for sharing.